Laundry day today. Every time I fold my T-shirts I think about when and where they came from. At this point about half of my non-V-neck T-shirts are still from my days as a stagehand at Arco Arena in Sacramento. There it was common for a show to hand out T-shirts to the crew at the end of the load out. Occasionally they would be used to establish crews, with different colors indicating whether you were, for example, in sound, or carps, or backline, or lighting. More often they were all the same. One I saw today I was particularly proud of. It was from a show called Walking with Dinosaurs. 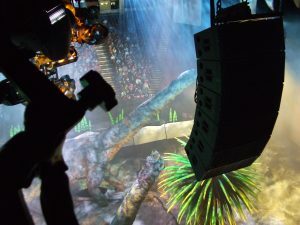 Walking with Dinosaurs was supposed to be a TV show and the show we did at Arco was an arena tour version of it. I say supposed to be because I had no direct knowledge of it. I worked the shows on truss spot, which is sitting in a seat about 30′ in the air and aiming a small spot light at various people. I say people even though the stars of the show were these huge mechanized dinosaurs that slid across a special floor and acted out a story narrated by a guy walking amongst them. As the show ran several days I brought a small camera up to my perch on the third or fourth day and snapped some pictures when my light wasn’t being used. They’re not very good. This one is the best at conveying the size of the dinosaurs. You can see the Arco audience in the background. The shadows in the foreground are one of the speaker stacks and the frame holding my light. But back to the T-shirts. For the load in and load out of this show, I was assigned a fork lift. I spent a whole day driving around to large trucks and lifting pieces of these dinosaurs off and taking them into the building. Fork lifts were a common accessory for the shows that came to Arco but it was rare that I got to operate one. I never considered myself an expert but I did ok. I ran a fork lift perhaps a half a dozen times at Arco. This show taxed my skills to the limit because the dinosaurs were not only heavy but bulky. It was important to maintain a low center of gravity while moving them. Some were unloaded in the parking lot and driven inside up and down ramps. So, my T-shirt was the same color everyone else got but mine said ‘Fork Lift’ on it. I think there were probably three of us on that show so that was a pretty exclusive group. The show was in 2008 and the T-shirt is showing signs of age. I’ll probably put it in the Goodwill pile before it’s completely trashed. Somebody might like it. OK, I’m going to vent here. All these people – most of them friends of mine – who moan about how 2016 is a terrible year because Carrie Fischer died, or George Michael, or Prince, or some other celebrity or pop star that I forget right now: get a grip!! I made reference to my original ‘puzzlement‘ post today in an email and I thought of a comparison. Saying ‘Zach is dead’ is like saying ‘the Pacific Ocean is huge.’ Intellectually you know it is true but you really can’t grasp the real size of it. I started writing a post about writing and how long it might take for a writer (or anyone else, really) before their writing would be critiqued by anyone other than the writer. I wrote the phrase ‘thousands of hours’ and immediately thought of Malcolm Gladwell. Zach had an infatuation with Gladwell at one time and actually introduced him to me while he was at Xavier. Gladwell famously posited in his book The Outliers that ‘the key to achieving world-class expertise in any skill, is, to a large extent, a matter of practicing the correct way, for a total of around 10,000 hours.’ The quote is from the Wikipedia article so it may not be completely precise, but it makes my point. Searching ‘Gladwell’ in my folder of Zach’s journals gets 11 hits. In one of the earliest, he reflects on the 10,000 hour concept which leads into a discussion of another article which leads into his own goals and how he could direct his own learning and development. He says, ‘ . . . one of the great things that I always am trying to improve is my deliberate approach to my own growth . . .’ This was in December 2011, six months after he started working at UREC. Early on, the posts seemed to flow from my fingers. Lately they haven’t and it bothers me. I’ll keep trying. Thank you, dear reader, for coming here and getting this far.